SAN JOSE, Calif. – NHL expansion is going to happen, with either Las Vegas or Quebec City or both applicants getting franchises. Or maybe it will, but a while from now. Those are the three scenarios that NHL Commissioner Gary Bettman is spelling out in the last week, both at his “State of the NHL” speech and in other media appearances. The Executive Committee will recommend on expansion well ahead of that Board of Governors meeting in Las Vegas, which takes place ahead of the NHL Awards on June 22. Let’s take a look at where the various moving parts on expansion (and relocation) are at the moment. The “deferment” option was one that hadn’t really been mentioned by the NHL before, so that perked up some ears. Discussions about expansion have been seemingly centered on the 2017-18 season, and deputy commissioner Bill Daly said that “Nothing about our current timing precludes '17-18.” But there seems to be some smoke around the idea that the owners will ultimately defer expansion by a year to 2018-19. If expansion is kicked down the road one year to 2018-19, it might do more to agitate Las Vegas owner Bill Foley, who will have an arena and everything else he needs in place for a 2017 launch. Giving teams an extra year of loopholes around the expansion draft is bad news, although it would lead to some interesting contracts. Let’s say David Backes signs a six-year deal somewhere – would be get a no-trade for the first three years and then a no-move after that, just so a team keeps its expansion draft options open? The current plan, according to the NHL: Teams can protect seven forwards, three defensemen and a goalie, or eight skaters and a goalie. Rookies and second-year players are exempt. 1. Daly said that first and second-year “professionals” will be exempt from the draft, but there’s a “specific procedure” in place to define what a professional is. 2. Daly said that the “minimum cap hit” provision has been dropped; i.e. having a minimum amount of cap-related salary made available in the expansion draft. 3. On the no-movement and no-trade clauses, Daly said the latter wouldn’t prevent a player from being exposed in the draft. A no-move clause, however, means a team would have to protect that player and they would count against a team’s total. 4. If a team, for whatever reason, violates the expansion draft rules, there will be “significant penalties” including loss of draft picks or players. Obviously, with any talk of deferment comes talk that they’re deferring to buy Seattle more time to build an arena and rally around one ownership bid. 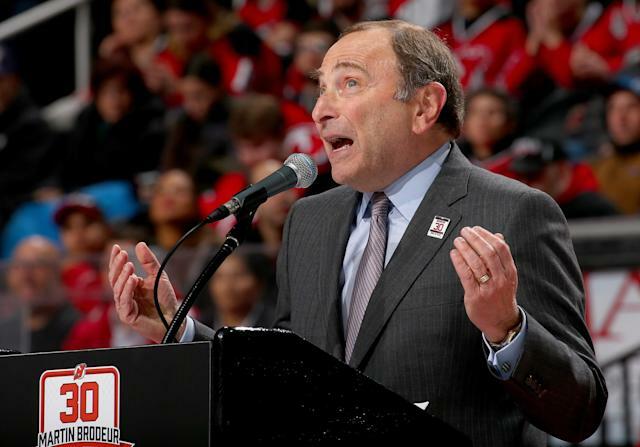 Bettman reiterated that the two bids in front of the NHL are the only bids they’re considering. “It’s not like we’re pining after Seattle. There were three different groups from three different places in Seattle saying they had interest, but nobody seemed to get their act together as far as a new arena,” he told Sportsnet 590 this week. In April, Bettman said the lack of arena plan had slowed the city’s momentum. “It’s clear, at least to this point, that there appears to be no arena process. And I think that has discouraged lots of interest. And I’m not opining as to whether or not it’s anybody’s fault or responsibility. It is what it is. And so we have other things to focus on,” he said. While the NHL likes the market, the area is a sticking point. The NBA’s return to Seattle, potentially, is a consideration when the NHL’s looking at how many dollars are really there for the taking. “There are places where based on the market size, maybe you don’t want both teams there,” said Bettman. Well, Bettman says it’s no big deal. “I think what’s going on in Carolina is being overblown. It’s a family dispute going on. As far as we can tell, it’s not about the franchise. It’s something about a father and his sons,” said Bettman on Sportsnet 590. Hey, they still have a fairly new arena and no NBA competition! What about them? “Kansas City, as far back as I can remember, has never really been in the mix. It’s not a market that’s been focused on. It’s not a market that’s had people with potential ownership aspirations bang our doors down,” said Bettman on Sportsnet 590. If the NHL goes to Las Vegas and Quebec City, will both teams go to the West, to balance the conferences? Would Quebec go East, with an East team going West? Will there by an realignment? Bettman made it clear that the NHL doesn’t intend to move the Detroit Red Wings or Columbus Blue Jackets back to the Western Conference, no matter the scenario. Bettman said the Board of Governors wouldn’t approve that move, either. I still think it’s expansion by one team, and that team will be in Las Vegas. But all the chatter we’ve heard during the Final has me really wondering if it’ll launch in 2017 or 2018.